Varutharacha is a Malayalam culinary term which means roasted and ground coconut paste, sauce or gravy. This gravy is used in preparing various curry dishes in Kerala, called Varutharacha Curry which literally means „in roasted and ground coconut curry“. Varutharacha Curry is one of the most popular foods from the Kerala cuisine which can be made with egg, fish, chicken, beef, vegetables, etc. 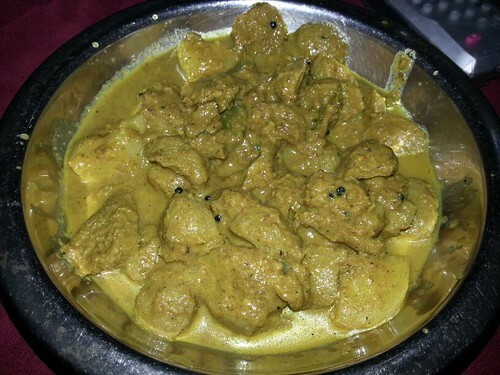 Picture on this page is Varutharacha Soy Beans and Kozhi (soy beans and chicken cooked or simmered in roasted and ground coconut paste, sauce or gravy.